After the American election last November, in the bleakness of the weeks that followed, I found myself making tiny collages and drawings for myself and to send to friends. Three of us started a small reciprocal putting-things-in-the-mail project of assigning words to each other – courage, tenderness, delight, solace, trepidation, audacity – to illustrate on a tiny and highly intimate scale. We mailed them back and forth for months. Something about the miniature acts of creation centered me, kept my hands busy, kept my mind healthy, perhaps reminded me that small gestures can have large meaning, especially when they weave relationships together, especially when they keep us afloat in a storm. Not for poetry the head-on meeting of inquiry and object found in the essay, the debate, or the letter to the editor. A poem circles its content, calls to it from afar, looks for the hidden, tangential approach, the truth that grows apparent only by means of exile’s wanderings, cunning’s imagination, and a wide-cast, attentive silence. Poems do not make appointment with their subjects – they stalk them, keeping their distance, looking slightly off to one side. And when at last the leap comes, it is most often also from the side, the rear, an overhead perch, from some word-blind woven of brush or shadow or fire. I think about this often, the large and the small, the direct and the tangential. I think about the idea, one I’ve heard proclaimed by several people as a personal vision, that we should each aim to make the biggest difference to the largest number of people possible. I can’t really argue with this goal, but the first time I heard it, I felt my heart sink. Clearly, as a mother with small children – albeit now larger – whom I had decided to homeschool for an undetermined length of time, I had abdicated this kind of heroic vision for myself. My influence might arguably go deep, I thought, but it would not be cast wide. As a voracious reader and follower of internal tangents, I recently became absorbed in reading fairy tales, fascinating maps of human development and age-old troves of insight. One thing I was reminded of – which in youth would have made me want to scream, but in early middle-age I find highly reassuring – is how often the individual path to heroic goals leads through a lot of very minute tasks: the separating of poppy seeds from sand, the plucking of a tail feather from every bird in the world. Or sometimes a commitment to years of repetitive work required in order to move on to the next stage of the journey. The heroic journey rarely looks heroic in the middle of things. It is ordinary, repetitive, slow: very much about showing up and doing the work, very much about patience. And the repetitive tasks themselves, of course, can only be accomplished with help. Beware anyone on the heroic path who turns aside from the smallest request from the smallest creature – the ant, the bee, the bird, the fish. In the fairy tale world, stepping off the path to help is always the right choice. Without the turn off the path to answer the call for help, without the reciprocal relationships that are birthed from generosity, the impossible tasks encountered later on the path would remain impossible. The heroic journey so often emerges out of making a difference to one small creature at a time. It’s the reciprocity, the collaboration formed in those small connections, that makes room for creative and intuitive shortcuts that unlock the gates of the most impossible tasks. I think about this when I attempt to be single-minded. “I’m going to be a writer. Seriously,” I say to myself, and so I cut down on outside commitments, I attempt to keep my focus, I disengage a little from the world. And I do increasingly believe that to be of service in the world comes not out of being always available to outside requests nor out of other people’s sometimes limited definitions of one’s abilities, but from a place of discernment deep within that knows what ignites us and what delights us and what is our own particular gift to share. In other words, good boundaries, clarity of vision, and abundant self-knowledge. And what is separating poppy seeds from sand all about if not discernment? That doesn’t, however, account for the ongoing moral need to keep stepping off the path. Stepping off the path to stay engaged with what is needed in the wider world. Engaged and alert and responsive, but not obsessed, not so overwhelmed that we forget our path entirely. And yet stepping off the path is a crucial part of the story; without it the story would have no heart. Stepping off the path is in the end what makes the necessary discernment possible. It’s what brings us into the interdependence that will make the story whole, that will make us whole, that maybe – maybe – will make the world whole. What I see for myself as I chew over these questions is the need to take things step by step, to start with what and who is nearest to me and let those actions ripple outwards. I don’t believe that it is always easiest to be kind to those who are closest to you, to those who share your DNA, your home, your table, your neighbourhood. Sometimes it’s the hardest thing. And that small-scale kindness, if it is maintained with intention, context, and an outward eye into the world and its needs, has its impact. Compassion ripples outward. There’s a balance that I am constantly looking for between the shouting of the online world, which I sometimes mistake for a required form of civic engagement, and withdrawal from it. Some balance which uses the tools of modern life in ways that are generative and meaningful. Some balance that allows me to continue to speak in my own elliptical voice with its own particular clarity, instead of requiring me to adopt the linear language of argument. Some balance that focuses on the good and the beautiful, but is not afraid to look the shadows of hate in the face and call them out by name. Some balance which attempts to locate itself in small, real-life encounters and relationships, in small-scale acts of creation, in loving gestures, in patience, in intentional conversations with strangers, in being available to friends and neighbours, in being deeply at home in the more-than-human world. In sum, in that foundational element of life which is mostly about showing up, wherever and whoever you are. Our culture sometimes tries to tell us that only large gestures have meaning, that only large voices can be heard. This is a fallacy of individualism, but so is the idea that small gestures that we undertake divorced from context, community, and systemic change can make a difference in a world that is at its core all about interdependence. Small-scale gestures in relationship, repeated, multiplied, passed on, rippling outward, set down the stitches and repair the tears so that larger tapestries of healthy communities and cultures can emerge. Perhaps it also helps to take an ecosystem view: what have we learned about the cascade effect of taking any element out of the system, out of the complex web of relationships that is tightly and perfectly woven, each piece depending on all of the others? I remind myself that whatever my small piece is – and humans have so much more trouble inhabiting this than other creatures – I need to root myself in it. That small piece is, in some way, absolutely necessary to the whole. I insist on radical hope in myself, even when in my Eastern European moments of fatalism I wonder how long this can all last, everything our culture takes for granted. I try not to take any of it for granted. I try to be absolutely clear with myself where the privilege is in my life, where the gifts, what I need to heal to keep the ripples moving outward in ways that are generative and healthy to myself and others. The piece I hold is not too small; the piece you hold is not too small. But let’s keep connecting them. We need to keep trusting each other to love the world and everything in it, and to keep doing the things that need to be done, with discernment and generosity, courage and tenderness. That is the most and the least we can do. Images by Malgosia Halliop, Camille Glodeck, Heather Wheldrake. Photo by Camille Glodeck. First, stop, close your eyes, and listen. You may be tempted to open your eyes, but you will hear more that is true if you first keep them closed. Breathe into your heart, your belly, all the way down to your feet. Stand still. Let the waves of sound crash over your head: the hum of traffic, the roar of airplanes thousands of miles above you, the shrieks of laughter, the sirens, your neighbours shouting, sparrows singing, small children’s tears. Keep listening. To love a place you must listen beneath what it pretends to be, listen to what hurts it and what makes it most alive. Open your eyes slowly. Keep your ears open: to the whispered greeting beneath the noise and bluster, the first sigh of recognition, the soft hello. To love a place, start walking. You can’t fall in love in a hurry, closed up in steel and glass, shutting out the seasons, blocking out what’s real. Each step is an offering of your presence, a necessary courtship, an invitation to a dance. Under your feet your aliveness meets the streets, it meets the skin underneath the rigid garments, it coaxes and teases and lays down your tracks. This isn’t possession, it’s a rite of celebration, a deep soul connection, a blessing. It’s your way to see and be seen. To love a place, explore with slow urgency. This is not haste, it’s a courtship of delight. What will you find in the alleyways, between the spreading trees, in the unkempt fields of goldenrod and asters, deep down in the ravines, by the river’s edge? Don’t be afraid to open your senses – what you discover may enchant or alarm you: the rough bark of maples, the smell of the porous earth after a storm, bold green plants pushing through the sidewalk, trees heavy with fruit ripe for your picking, hawks wheeling wide above high-rises, rabbit tracks stretched out beside train tracks, nestlings cast cold to the ground by heavy rain, piles of cigarette butts and indestructible coffee cups, the stench and rot of last week’s compost spilled out by raccoons. It’s all real; it’s all true: both the pain and the beauty. You’re not perfect either. To love a place, don’t distain, don’t turn up your nose, don’t turn away, don’t let others shame or disparage. You need to keep coming back. Listen to its stories, tend to its wounds, be mindful of its past, be kind. You can be a healer, a caretaker, a lover, a friend. To love a place, you must keep showing up. You must map your joys and griefs slowly over its surface and its depths; you must weave through its wide and narrow spaces your own bittersweet life. If you are patient, the place you love will one day shake off its shyness. It will look you in the eye and share its secrets. It will pull back its hair, uncover its shoulders, uncross its arms and legs, let you in everywhere. I tell you, I promise you: the place you love will love you back. It started at midnight. Or the night before. It started with the movies, the long walk home, my aching back, the dripping mist, the glare of streetlights, cab drivers turning aside from my tautly rounded belly. It started with a gush of water, with a catch of breath, with darkness, with pain. In the middle my body turned inside out. I became elastic, bones came through me, my heart slipped outside my body. It was torment. And magic. And an everyday wonder. And the oldest story told for the first time. And then there were your long limbs, your blinking eyes, your open mouth; your fragile, red, wriggly being slipping out into the afternoon light. You were more familiar and more alien than anything I had ever known. I was exhilarated, enchanted, exhausted. All my borders became permeable. The truth is, for some time I only existed for your survival. My body flowed with food for you. I breathed with you, cried with you, laughed with you, slept your sleep, woke your waking, kept you alive. On this day I was a doorway. I was a boat carrying you into this human life. The wild impossibility of birth brought the rumour of death with it too. One slipped out with the other to dance together through a complicated world. I was born then too. There was no bridge back. I can’t remember who I was before this day. Twelve years later. It feels like a long time ago. But I want to remember these details. I’ve taken a long hiatus from this blog again, and why? I’m not any busier than I have been since I started writing here. In truth, I am probably less busy. Perhaps I feel less able or simply less willing to juggle many balls at once, albeit many of them having been visible only to myself. I think that overall this is a good thing. In recent months I find myself consistently and unexpectedly getting eight hours of sleep every night. I find myself delighting in my own company. I even find myself saying no to many things that could bring me joy, because once there are too many things piled upon each other, the joy slips away. The word that has been sitting with me recently is discernment. Discernment is often challenging for an enthusiast. Everything that approaches me seems equally exciting, equally possible, equally worthy of my attention. But if I spend my life responding to external invitations, however enticing, when do I sit still and listen for the quiet inner voice, the whisper of intuition, my internal truth? Recently, I find myself asking these questions of everything that asks to find its way into my life: Is this necessary? Does this feed me? Is this truly using my gifts? Is this the best way to be of service? Is it wise to say yes to this? What do I need to give up in order to make this possible? Because there is always something that I will need to give up. I read recently that midlife starts when one begins counting down until the end of life instead of counting up from the beginning. The parts of life that seemed impossibly far away and perhaps not very interesting when I was in my twenties and thirties now loom huge and close and fascinating. Age has become more interesting than youth. And it feels like time to worry much less about what to do and much more about who to be. As I look towards the elders in my life for maps of the route ahead, I’m also recognizing how much I am soaking up the mentoring I find in books. Reading has often been a baseline for me, sometimes it’s been an escape, often it’s been an anchor, and sometimes it’s been pushed to the side for more active pursuits. But now I find myself reading voraciously again, in a way that feels like deep nourishment for my soul. I am ravenously hungry for wisdom. A couple of years ago, I felt a bit unhinged. I found myself facing parts of myself that had long been lonely, self-critical, armoured, afraid. It was time to face them. I spilled a lot to a few people, spent a lot of time writing, re-established some good grounding and creative practices, learned to be much kinder to myself. But for some time I also found myself grabbing hold of certain books and carrying them around with me, feeling reassured by their physical presence, by what felt like the voices and stories of people wiser and kinder than myself reaching out to hold me. That year, I spent a lot of time with Tara Brach’s Radical Acceptance, Sue Monk Kidd’s Dance of the Dissident Daughter, Francis Weller’s The Wild Edge of Sorrow, David Whyte’s Consolations, anything by Brené Brown and Pema Chödrön. After that I read everything I could find by Martin Shaw, Stephen Jenkinson’s Die Wise, Sharon Blackie’s If Women Rose Rooted, and finally and slowly – after looking at its thick spine sitting on my desk for several years – Clarissa Pinkola Estés’ Women Who Run With the Wolves. I’m still working on that one. In the midst of these – along with much poetry and some fiction – I’ve read many other books: on writing, art, love, community, spirituality, psychology, mythology. But only some of them stay with me as elders and mentors. Right now, inspired by the Clarissa Pinkola Estés and by an online course with Sharon Blackie, The Mythic Imagination, I’m reading a lot of fairy tales and folk tales. I love this deceptively simple form, the richness of it, the symbolic motifs, the universal questions. It brings out the scholar in me, the long-ago English student, taking delight in finding patterns in puzzling places. Looking to folk tales for mentoring, I’ve come across two books by Allen B. Chinen, one of stories for midlife, one for elderhood. It is both unsettling and reassuring to find that everything that has preoccupied me in recent years is a developmental stage of this moment of my life. I may have known this in theory, but reading the same themes repeated again and again in folk tales from around the world brings it into my heart: I am a small piece of the puzzle, an ordinary human with ordinary human problems, “a small detail on the landscape” as I heard someone recently say, a phrase that I continue to find oddly reassuring. Henry Miller wrote: “You observe your children or your children’s children, making the same absurd mistakes, heart-rending mistakes often, which you made at their age. And there is nothing you can say or do to prevent it. It’s by observing the young, indeed, that you eventually understand the sort of idiot you yourself were once upon a time — and perhaps still are.” I can see where I would like get to as a human, but I can’t get there any faster than my human capacity will allow. Now, at midlife I have one foot in the ambition of youth and one in the generosity of the elder, stuck between expecting always to be rescued by magic and knowing enough to rely on my own practical wisdom, caught in between believing that the treasure and the prince are always mine to win and learning that, eventually, everything precious is meant to be given away. January is always a hard month. And somehow this always surprises me. Somehow I think I’ve braced myself against it, I’m ready, and then it hits me, and I feel myself going under. There are little things that help. I am learning to reach out in those moment to a few dear friends, to say “This is a hard day, can you sit beside me and hold my hand?” even if this holding sometimes happens over a distance. I am learning to write it out, to move, to give myself space to witness. I am learning to always let myself cry when I need to. When I feel myself going under, there’s no way to rush through it. It takes patience, and compassion, and repeating each day the practice of things that normally bring me joy, until something catches me up again – something beautiful, something moving, something that makes me laugh out loud. I know I am coming back when I remember my sense of humour. And I believe that sometimes we need to fall apart. We can hold ourselves together for only so long, and then it becomes too much work and we need to crumble, and then crumbling is a relief. Disintegrating is a relief. Because then the effort required to keep ourselves together, to present ourselves as intact and well-protected, can be dedicated to other things. Crumbling, in itself, becomes less something to fear. And yet, sometimes it is hard to be around people in this crumbled state. Everything is exposed, and while the wounds may need to be aired, there is still the need to keep all the grit from getting in, the need to keep the wounds clean, if possible. The awareness that everything is sore and sensitive and needs to heal, even if healing is sometimes a lonely thing. Perhaps tears also help us clean the wounds, so that they don’t fester, so that they are simpler to tend to in the end. I don’t think it’s possible to get through life without times of darkness, and what brings these on is not always obvious. I can love my husband and children, I can count my blessings, I can see that the world is beautiful, and I can still sometimes find it hard to get through the day. It is not always possible, or helpful, or necessary, to find a label for this, but sometimes it is. There is a deep descent, sometimes in stages; there is the knowledge of inner terrain that needs to be navigated and passed through; there is a period of separation. Sometimes we need help to come back out into the light, sometimes we reach it in our own time, with patience and awareness and presence. And when I woke up that morning, I felt the story she sketched out, the narrative arc of that journey, slowly pulling me up again. It took me out of the eternal present. It made me see that the darkness is one step on the journey, that it is part of the cycle, that there is a time of return to the light. It made me feel the possibilities of deep mining, the hope that there is some magic or some medicine to be found there, that there are always gifts to be found underground. will come up where you are. You’ve been stony for too many years. I fell in love with a dandelion last week. And when it died, I mourned it. My children have been knocking the heads off dandelions a lot recently. It’s something I have mixed feelings about. Contrary to the perfect lawn culture I grew up in, I have a lot of respect for the resilient and versatile dandelion. But I also see that children help them spread their seeds around. And I see that the survival of the hardy dandelion isn’t threatened by children’s games. And I am always trying to strike a balance with nature – with nature and kids in particular – between joyful and immersed interaction and respect. A few weeks ago, as part of some learning about plants I’m working on right now, I chose a dandelion plant in my backyard as a focal plant to observe over the next three seasons. I knew that it would be hard to protect a dandelion in my backyard. But I had clearly voiced to my family my desire to protect this one. 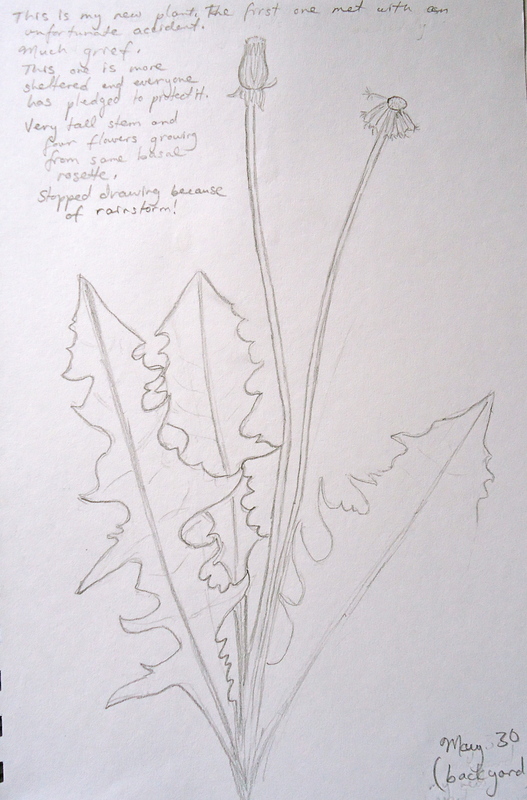 And I had decided as a method of observation to carefully sketch the plant every few days. I felt kind of blissful realizing that I could learn about this plant while doing something else that I loved and wanted to practice more often. 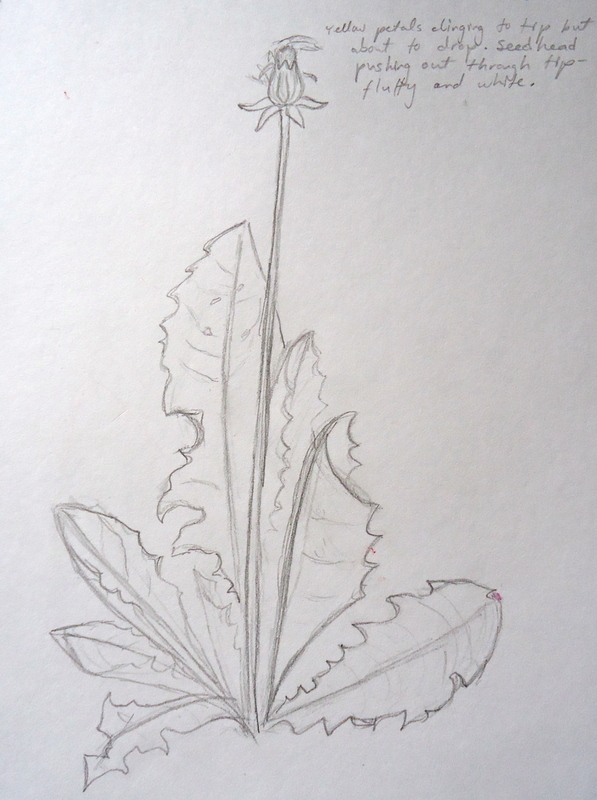 In two days of lovingly sketching “my” dandelion and others, I already knew more about the stages of the plant’s development than I ever had before. I observed and admired the bright yellow ray of florets, the graceful curves and tapers of the toothed leaves, the translucent green of the elegant flower stalk. I watched the yellow flower close for a period of time to undergo a transformation, with the dried florets slowly pushed up out of the flower by the combined force of perhaps more than 150 tiny single-seeded fruit attached to silky pappi. I was waiting, anticipating the bursting open of the delicate perfect sphere of the seed head, anticipating its daily dance with the wind and the gradual dispersal of its tiny floating seed progeny out into the world on their silken parachutes. Anticipating the slow wilting of the flower as the plant’s energy travelled underground to the deep taproots, digging down and breaking up the soil, aerating it for other plants to grow. But as my family prepared for a late-spring dinner in our backyard one evening, I stepped out onto my back steps, looked at my son standing with a strange look beside the tomato bed, and instinctively said: “Remember not to touch that dandelion!” Right away, I knew by his stricken expression and hunched shoulders that it was too late. He burst out crying, I burst out crying. It was so clear that he felt terrible already, but I had a knot in my stomach and tears in my eyes and needed to speak my distress. Recently, I am often surprised by my intensity of emotion. I went into the house and sat on the couch shaking. I had felt deep satisfaction imagining myself carefully watching the growth of this plant, imagining myself developing a relationship with it over many months, imagining the reciprocity of tending for the plant as I learned from it. Was it futile to think that I could keep a dandelion alive for that long? Couldn’t I protect just one plant? Couldn’t I watch it move through its growth cycle in peace? Could I convince anyone of the value of a dandelion? Was I upset because my plans were disrupted? Or was there an energy that flowed from me to the dandelion and back again, through my careful observation and loving attention that in those moments was a little like love? Paying attention to anything or anyone so raptly plants the seeds of connection. Connection nurtures love; perhaps it’s the same thing. And love leads to caretaking, to protecting, to reciprocity. Connection, love and then caretaking: as my eyes are open wider to the world, I see this pattern, over and over again. This is not to say that death doesn’t belong in this cycle; it’s inevitable and even necessary. I am not sentimental about this. To be human is to face the truth that we can’t live on sunshine and rain: we must kill other living beings to survive. But there is the cycle of life and death and rebirth, and then there is random destruction. There is the reciprocity of picking dandelions and cooking with them, of savouring the bitter young greens in a salad, of digging the root and using it for medicine, of feeling gratitude for what these things bring into your body. There is also the careful stewardship of a space, a healthy habitat, that sometimes requires choices about what will live and what will die. And then there’s death or destruction without a purpose. A broken connection; a broken cycle. And that break brings mourning. It’s easy to fall in love with the big and beautiful: moose, foxes, deer, sandhill cranes, owls, and I have done that too. But it’s the more humble beings, like dandelions, like dragonflies, that catch me by surprise. Last fall, on the small farm in Poland where my father grew up, I sat under a mountain ash and read from David Abram’s The Spell of the Sensuous. It’s a hard book to read; in many ways it’s a highly articulate anti-book, an ode to the primeval language of the pre-literate world and of all the communicating living beings with which we are in relationship. It’s a book that’s best read outdoors, in small bursts, with all senses open to what the world is saying. As I read, dragonflies flew all around, dozens of them, as well as maybe hundreds of European Peacock butterflies, dark orange with two purple eye spots on each wing. As I held my open book on my lap, a red dragonfly landed on the dazzlingly white page. It perched – if that is what a dragonfly does – and faced me. I raised the book higher and stared at the dragonfly. It stared back at me with its giant compound eyes. I understand that dragonflies have much clearer vision, in the human sense, than many other insects. But I don’t really know what it saw. What is the world-view of a dragonfly? What it looked like to me, however, was that the dragonfly was watching me as I was watching it. It was a strangely astonishing display of mirroring. I looked quizzically at the dragonfly; it cocked its head to one side, then the other, and again, as if was looking at me with the same curiosity. Dragonflies, from a mammalian point of view, have remarkably appealing faces. Their compound eyes are huge and beautiful, and a raised section of the face in between those eyes, called the vertex, looks like a small round nose. A tiny earnest face stared unblinkingly at me as I stared carefully back. It was the most connecting moment I’ve ever shared with an insect. When you look at something very closely, your perspective changes. When the dragonfly took off, I was almost thrown back with surprise. Its body swooped up huge towards my face, filling my field of vision, a giant prehistoric winged creature, iridescent and magical, communicating with me from another world. That moment was also a little like love. I have mourned my dandelion flower, and with my son’s help found another plant to study in a more sheltered spot. I have watched the metamorphosis of its flower parts, drawn it, and learned from it. The first dandelion has not produced any further flowers, but in truth, its leaves and root are still alive; there is still more to be observed, now that I have regained my perspective. I have not since locked eyes with a dragonfly. But each moment of connection to dandelion, to dragonfly, creates a relationship that opens space in my heart for other strange and surprising encounters. In some way, it means that I have friends in the world that I didn’t once have, perhaps an infinite number, both curious and familiar; that as I pay attention, as I take care, I am cared for in turn. The world is full of remarkable beings, of beauty, of curiosity, of connection, of love. My work – our work – is to recognize all these beings as part of our community, part of our family, and to treat them honourably and with care. Our work is allow our selfhood to be a little more permeable than we once believed – not only to other humans, not only to our familiar domesticated creatures, but to all of the wild. To all of the beings that seem nothing like us, that we think we can’t possibly understand, that have gifts and abilities well beyond the scope of the human, but that are our relations nonetheless. Can you live as the person you wish you were? The weekend before my fortieth birthday – as a kind of present to myself – I spent several days at a workshop with a group of women: sharing personal stories, listening deeply, tracking our patterns, talking about fears and shame, releasing things that were no longer working. At the end of the weekend, we were asked to set goals to create a new habit around something we had worked on over the weekend. I, mind racing, thought of All the Things I Need to Work On. I blurted out a couple of very small goals, as I should have done in the first place: to sit on my back steps for a few moments each day in quiet and awareness, and to create a moment of ceremony each morning to offer some gratitude and prayers and set intentions for the day. Then proceeded to cry through all of the closing. The weekend was almost done. There wasn’t much time left to dig any deeper. I certainly wasn’t the first to break down that weekend. In many ways, that’s the point: to let down those defenses of the tender places in your heart, and let people in, knowing that your story is always in some way their story too, sinking into the trust that’s been built through talking in a circle. Through carefully and lovingly watching the faces around you, through honouring confidences, through watching each person struggling to express vulnerable truths about themselves. In the hour before we packed up, someone hugged me and told me I didn’t need to push myself so hard. “What does that even mean?” I wondered, as I always do, because it’s not the first time I’d heard it. I cried again when I got home; I cried again when I woke up the next morning, my birthday. A week before I had been almost smug with confidence about moving into a new decade of my life. I tried to pull apart the overwhelm of that moment: too many commitments, too many expectations of myself? That wasn’t quite it. Right, I get it. It’s a moving target. Something to aspire to and never reach. Something to motivate me to keep moving. It was a scary thought. I watched myself recoil from it. What would it mean? It would mean that I need to be accountable. That I can’t sulk. That I need to respond instead of reacting. That I need to say what has to be said, instead of withdrawing. That I need to stay open. That if I make a mistake, if I fall into an old pattern – as I surely will – I need to go back and own it. That I need to be aware of the impact of each word and action. That if I see that something needs to be done, I need to step forward and do it. That in every moment, I need to draw on my best self. It feels so much easier to keep putting it off. Maybe growth comes not of looking to the elusive self-improvements of the future, but of intentionally tending the seeds of each moment now and slowly unfurling our leaves and buds out of them until we burst into flower. Maybe. I might be willing to believe it. The frustrating but beautiful thing about truisms, I’ve found, is that I can fight against them for years until one day a voice inside me offers me the same advice: you can only live in the present moment. It takes me a long time to get the message. It’s hard to learn things like that from the outside. Can I move through each moment as if I’m already the person I wish I was? There is a tightrope, I think, that we need to walk on as our best selves, while compassionately picking ourselves up again when we stumble and fall, because even our best selves will always be imperfect. Can you live as the person you wish you were? Not as a mandate, but as an experiment: a thought experiment, an experiment of intention, an experiment of action?